Devils Tower, owned by Williams, is currently the deepest oil and gas production platform in operation. Located in the Gulf of Mexico, this spar platform sits 5,610 feet above the seabed. It is a hollow cylindrical structure, similar to a buoy, and roughly 90 percent of it is underwater. The upper section is compartmentalized around a flooded center well. Approximately a year after Devils Tower began production, it was determined that communication holes needed to be drilled into the ballast tanks. Lowe Offshore International, Ltd was hired to oversee this project, with Norse Cutting and Abandonment contracted to perform this task. 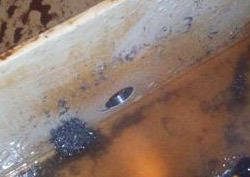 Abrasive water jetting and manual drilling were the two solutions considered to produce the holes. Testing determined that the abrasive water jetting was difficult to control, while drilling was more controllable and precise. Williams suggested using a CS Unitec drill. Lowe Offshore International Project Manager Bill Geiger contacted CS Unitec and discussed drilling test holes. Supplied with pieces of high-strength steel specially coated to prevent rust (like those used to construct the ballast tanks), CS Unitec began tests to determine which of their magnetic drills would be ideal for this project. 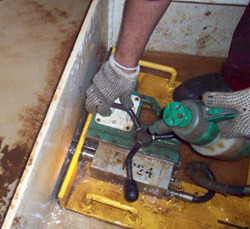 The AIRBOR™ pneumatic magnetic drill provided the high-torque drilling and powerful magnet needed to penetrate the coated steel of the ballast tanks, but the drill was too large for the 2-foot stiffener plates on the tanks. 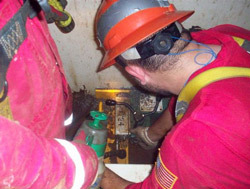 CS Unitec collaborated in the development of a specially designed jig that would replace the magnetic feed and hold the drill to the ballast tank. Over a 2-year period, the AIRBOR™ was used to drill approximately 300 holes into Devils Tower. Ballast Tank hole successfully drilled. “The communication holes have been drilled into the Devils Tower ballast tanks with great success. The drills that you supplied to Norse Cutting and Abandonment performed very well, without any problems,” stated Ed Bassett, Technical Supervisor, for CS Unitec. Mr. Bassett and CS Unitec received high praise from Lowe Offshore International for their exceptional customer service, noting that cutters ordered from the platform were shipped overnight to the platform helicopter dispatcher who had them out to Devils Tower within hours.